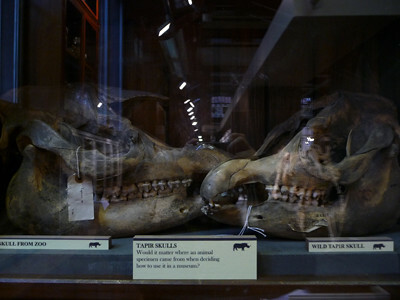 During a recent visit to London I stopped by the newly opened Grant Museum of Zoology. The museum had moved into rooms on University Street previously occupied by a medical library, and the furnishings were over 100 years old, which gave one the feeling that the collection of skeletons on display had always been there, not just for the past several weeks. 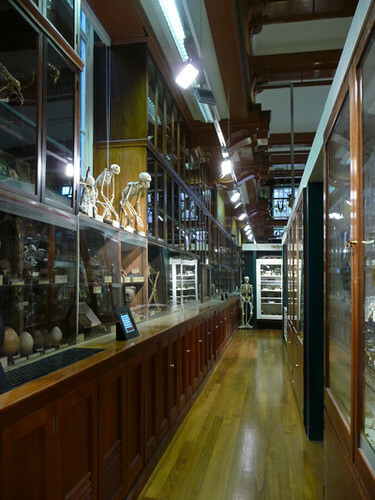 The bulk of the collection is displayed in one large room, with hundreds of skeletons of every possible vertebrate crammed densely in the display cases (fig. 1). Standing in a corner, looking a bit out of place is a human skeleton (fig. 2 and 3). A gallery on an upper level overlooks the room. 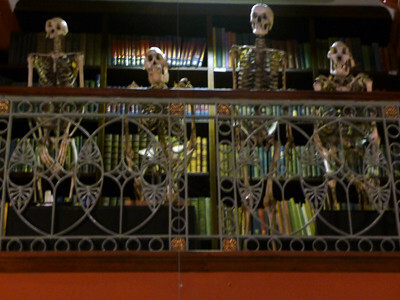 Several skeletons of apes are positioned leaning on a wrought iron railing as if they were looking down on the visitors. A custodian noticed me taking a photograph. “The third from the left is Barbara,” she said, pointing out the human skeleton among them (fig. 4). Fig. 1. 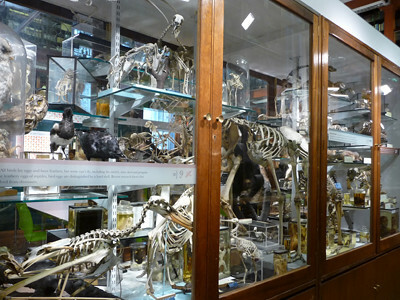 Display cases at the Grant Zoology Museum are crammed with fascinating specimens. Fig. 2. 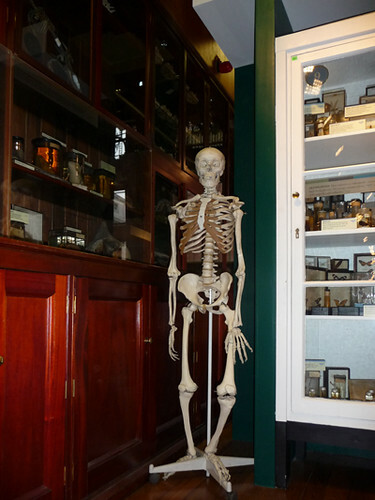 A human skeleton is propped in a corner of the room, out of context with the display. Fig. 3. I speculated whether the human skeleton was something the zoology museum inherited from the medical library, the former occupants of the space. Fig. 4. A human skeleton (third from the left) is displayed with apes. Dispersed throughout the display are cards with questions posed to the viewers (fig. 5 and 6). In addition, at the far wall of the large room, built into the counter of the display cabinets, sit a row of discrete interactive screens (seen on counter in figure 2). Each iPad posed a problem to the viewer, asking for comments (unfortunately, there were only few comments, as the display was newly opened when I was there). One of the screens addressed issues of conservation: Conserve or Display? How do we balance the needs of our specimens and the desires of our visitor? Most objects on display are irreversibly damaged by exposure to light, dust and fluctuations in temperature and humidity. The longer they are on display the shorter they will last. Indeed, specimens in storage will last longer without requiring conservation treatment and care; however, visitors would not be able to readily see the specimens. Without specimens there wouldn’t be a museum. The tone of the comments weighed more in the direction of displaying the genuine objects regardless of the costs. A few visitors pointed out the important role of the museum in raising human awareness for other species. However, there was one visitor who thought the specimens should be stored and models displayed. Another suggested a compromise, saying that replicas could be made of the rarest specimens, while the bulk of the collection could remain on display. Another screen posed the question of displaying human remains: Should human and animal remains be treated any differentially in museums like this? Why should human remains be treated differently? Would a primate display be incomplete without a human? Disappointingly, the comments by viewers were not serious, which was surprising, given the provocative nature of the issue (or possibly for this reason). The United Kingdom has a Human Tissue Act, which controls how human remains are displayed, used or stored. No human material less than 100 years old can be displayed without permission from the individual, implying that the two humans on display in the museum are either more than a century old, or are there because they want to be. I was a bit disturbed by the way Barbara was displayed together with the apes, not because I do not value the educative display of evolution of species, but because the apes in this case were endowed with human attributes imparting a comic tone to the display that clashed with the remaining exhibition, soberly displayed in glass-enclosed cases. I do think that there is a value to displaying skeletons of Homo sapiens alongside other primates, and this is the only way human remains should be displayed in a museum of this nature. The human skeleton standing in a corner without any relation to the adjacent display cases seemed not to be part of the museum collection. I felt that it was not allotted same respect other specimens were displayed with, and I speculated whether the museum had inherited the human skeleton from the medical library that had previously occupied the room. Yet another screen dealt with the issue of displaying replicas instead of genuine objects: Many museums use casts, reproductions and models in place of original objects. When is this appropriate? Should objects which aren’t “real” be highlighted? What is the point of a museum having a genuine object in store if they replace it with a replica for display? Most visitors’ comments favored displaying the genuine object: “It’s much more impressing seeing the actual animal.” A single comment, though, expressed concern about the preservation of the genuine object: “The priority of the museum should be to protect the “real” object.” Most viewers said that replicas on display should be identified as such. I agreed that the atmosphere of the museum would undoubtedly be different had the display cases been filled with replicas. Displaying replicas could also allow for a less traditional exhibition design, giving the museum a more contemporary appearance. However, it is not an easy issue. There are some cases where it is imperative that the objects on display are indisputably genuine – the museum at Auschwitz, for example. 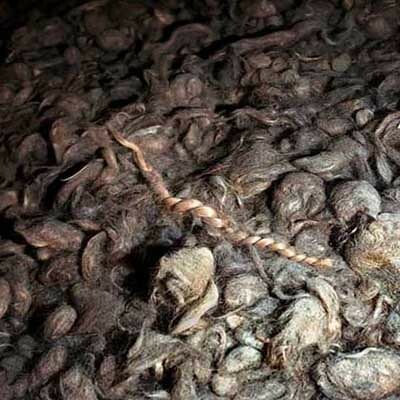 Replacing the mounds of human hair of the people who lost their lives at this death camp (fig. 7), or the mountain of shoes (fig. 8) with replicas could fuel arguments of proponents of Holocaust denial. These types of museums are faced with enormous challenges to preserve en immense amount of highly perishable specimens. Fig. 7 and 8. 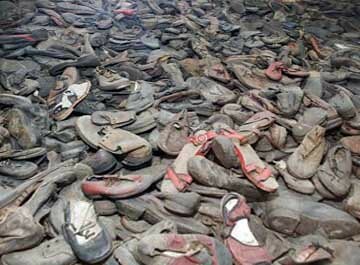 Human hair and shoes from the persons who lost their lives in Auschwitz. 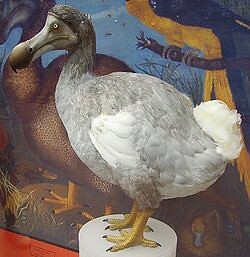 At present, museums of zoology do not tackle issues of such historically vital character (depending on your perspective of valuation of life on this planet), but had this been possible, wouldn’t seeing a real dodo be more convincing than pondering over a replica or an artist’s rendition (fig. 9)? Wouldn’t display of the ‘real thing’ make a stronger statement about mankind’s relationship to animals on this planet? I personally am more impressed by a static display of a dinosaur’s skeleton than with a reconstruction in full colour with mechanized moving parts, endlessly repeating robotic movements intended to make them more real. Fig. 9. An artist’s rendition of a dodo based on modern research at Oxford University Museum of Natural History. Authenticity in its many various interpretations is an intangible issue; it is a symbolic abstract concept inherent in the physical manifestations of the object. As invisible as it is, this is often the impetus behind many decisions pertaining to the preservation or display of an object. It is the foundation on which our profession stands, and therefore these considerations are important. But the preservation of natural and cultural heritage is meaningless if the people for whom we are preserving it cannot see it. 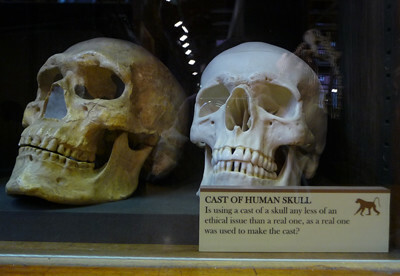 The danger of displaying replicas (not specifically referring to the Museum of Zoology in London) is that an element of respect for the uniqueness of the object is missing. When that is gone, there may be but a short step to disneyfication in our effort to interest viewers.